I just wanted to pass on a few lessons learned on my first oil change for the diesel. I'm not detailing a step by step oil change, just those "gotchas" specific to the diesel. 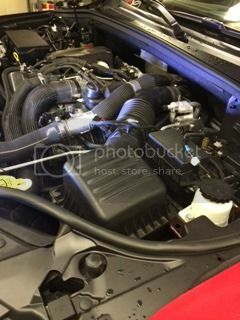 I purchased the Pennzoil Ultra Euro L 5w-30 as detailed in the manual. You can get a 6 pack of it on Amazon for $7.93 per quart. For the first change you'll have to buy two unless you want to pay the $11.92 per quart for the individual. Once you have the extras you will only need to buy one case for the next change. 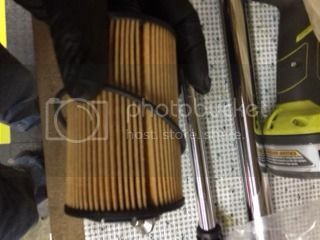 I bought the filter on ebay for $39.95 shipped. This was the cheapest I could find it. That puts the DIY oil change at $103. I think this is about as cheap as you can do it give or take a few bucks. I was able to crawl under the Jeep with the suspension in the Off-Road 2 setting. It isn't a ton of room, but enough. I also placed some jack stands under the front for safety. It isn't supposed to drop, but if you want to trust your skull to a Jeep computer go ahead. The drain plug underneath is easy to access as there is a cut-out in the under-tray. 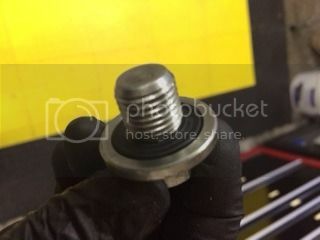 Use a 13mm socket to loosen and drain the oil. Once under the hood you'll need to remove some engine parts to get to the filter. 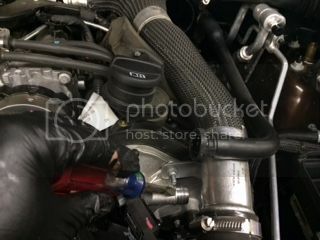 Then loosen the hose clamp on the intake by the cowl area and unclip the airbox clamps. You can then swing the airbox up and out of the way. I left it attached since the MAF wire has a troublesome little plastic clip on it. 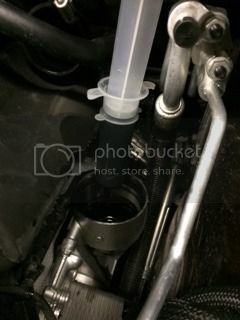 Use an oil filter socket (or a 1-1/16in socket fit fine) to remove the oil filter canister cap. You will tilt it to the side just a bit and hear the vacuum pressure release. Have a plastic bag handy to drop it into so oil doesn't drip everywhere. Now here is the biggest lesson I wanted to pass on. There will be a few ounces of oil left in the filter canister. If you drop the new filter and cap back on it is going to overflow as it pushes down. This would have been a huge mess. I used a 60cc syringe to remove the remaining oil. You will have to pull on the actual filter pretty hard to get it out of the cap. The base of it snaps in. When you put the new one in, be sure it clicks into place. Make sure your new filter comes with a new o-ring (this could be an issue once aftermarket companies start producing them. The Mopar comes with one). Remove the old one from the cap, lubricate the new one with oil and replace. Lubricate the small o-ring on the end of the filter as well. Do not over tighten the filter cap since it is plastic. It only takes 25nm. When I refill an engine with oil I always put in one less unit than the capacity. In this case the capacity is 8 quarts, so I put in 7. I then run the engine at idle for a few minutes to circulate the oil. I shut down and allow the oil to flow down. After a few minutes I will slowly add the last quart of oil checking the dipstick after every 1/4 quart (you'll have to wait a few minutes for the oil to flow down). This is important so you don't overfill, and it was evident with this engine since I only added 7.5 quarts of new oil. Had I just dumped in the whole 8 I would be over capacity. It only takes a few extra minutes to do correctly. How much does the dealer charge to do this? Great review. Thanks for the additional info. 2011 Overland - HEMi - Sold! Most dealers are independently owned and do not follow any sort of consistent price schedule. To get the most accurate answer, call the dealer that you wish to perform the work, and get a quote. Let me just say that I will be doing my own after getting the dealer to do it. It was almost 250$. Geez, that's just stupid expensive. 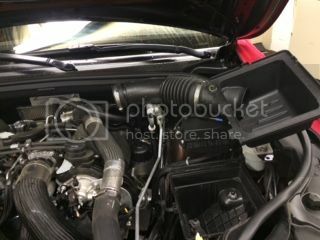 My buddy had a Mercedes S600 with a V12, and it was $100 for the dealer to do a synthetic oil change. I can't imagine why it costs so much for the diesel Jeep. I have the Diesel in my 14' JGC, and took it in for an oil change about a week ago at the local dealer in the Northern burbs of Atlanta. I didn't pay anything for it (the first few are free), but the price sheet for oil changes said $115.00 for oil change and 21 point inspection for Grand Cherokee Diesels. 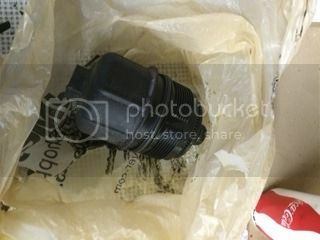 I saw them headed from the parts dept to my Jeep with a box of the correct oil (they didn't use bulk oil). They forgot to reset the oil change indicator, but everything else was ok. If you have someone else other than the dealer do the oil change, Fiat Chrysler is VERY specific about the oil to be used in the 3.0L V6. It's either the Pennzoil Ultra Euro L 5W30 or Mobil 1 5W30 (a specific one but I don't recall it off the top of my head). If you use the wrong one, you're f'd. That doesn't look fun. How often are these changes? I also don't agree with the 2nd guessing on the "amount" to put in. If the manual states 8 qts, use 8 qts. Your filling procedure is way too tedious, and there's no point. I've owned >25 vehicles, have always followed the manual, and have never had issues of over/under filling. Our closest dealer charges $189. It's pretty clear that if I've dumped in 7.5qts and the dipstick shows the oil to be at the full mark then adding another .5qts will mean it's overfull. If people don't want to take the time then that is up to them. Front Axle: 96XJ High pinon D30 with Vanco Raptor kit, Currie control arm bracket skids. I actually bought a certified MOPAR maintenance plan specifically for my Ecodiesel along with my extended warranty. On my 08 CRD, I did all my own work but for the price I was able to negotiate on the plan, it was not worth me doing my own work. And yes, I am an exceptional scientist and engineer. Can we copy this link in the diesel sticky? We added a reference in the maintenance sticky awhile ago.